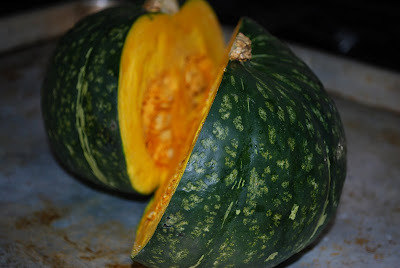 Jen's Gone Paleo: Kabocha Squash...YUM! I have a tendency to stick with butternut squash, when making roasted squash or squash puree, but recently started venturing out a little with the acorn variety. 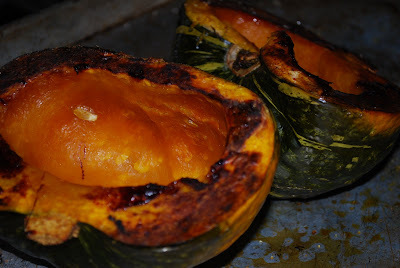 Well, one of my favorite bloggers, Heather at HEAB, uses a squash I had seen in stores, but had never thought about using...kabocha. I read about the tasty concoctions she creates and then go to the store and, once again, grab for what know. Well, this week I picked one up...SO GOOD!!! I have really been missing out and if you haven't tried them...you have too. I scooped out the roasted flesh and recreated this (I added a little water to the squash, as it was a little more dense/less watery than the acorn squash I used before). It is just so much creamier and sweet than the acorn squash I've gotten lately...it worked perfectly with my "Oatmeal" recreation. Try it!